Do you want your dog to be the center of attention? Would you prefer a dog that is properly groomed and prim? Or are you having trouble in addressing your dog’s nail grooming? To resolve all that, get the best dog nail grinder that is available in the market today. Providing your dog’s grooming needs require ample steps to achieve it. From maintaining fur to nails, getting the best tools are essential not just for you, but for your dog as well. Why is the Nail Grinder the Best Alternative? As a dog owner, it is your responsibility to keep your dog trimmed and proper. A properly groomed dog will help you and protect you as well. There are instances that dogs could be playful, but if the dog’s ﻿nails are high and pointed, it could be a threat to anyone that plays with your dogs. Your dogs might pose a threat to your children or to your family. With the recent developments related to grooming your dogs, the traditional means have been replaced with new advanced options. Instead of using a scissor-style clipper, some dog owners are now shifting their attention to using an electric grinder instead. A nail grinder is basically a grooming tool designed to cut or trim the nails of any dogs regardless of its size and kind. These are small tools with a rotating section that grinds your dog’s nails. It is also known as “dremels.” It can be used using electricity and trims the nails using friction. For the professional groomers and the vets, they usually promote the effectiveness of the electric grinder rather than using a dog clipper. Here are some of the differences between using a nail grinder and dog clipper. 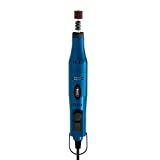 The grinding action is rather simple, and yet precise in comparison to using a dog clipper. The instances of breakages, pressure on nails and cracks are usually lessened or reduced when using an nail grinder rather than a dog clipper. Most nail grinders provide additional tools designed to polish your dog’s nails to eliminate rough edges since the rough edges could lead to snagging or even scratches. On a different note, there are still some dog owners that prefer to use the manual dog clippers. However, the problem with these tools is its effectiveness and safety. If the scissor-style clipper is a weak product, it could crack your dog’s nail or even result to pinching. Moreover, if there is guillotine, it would be cumbersome for dogs that have smaller paws. If you have a grooming tool that does not have the proper size and the strength, it might create problems in the future for you and for your dog. If the nail cutting tool is not reliable, it can cause pain, wounds, and even bleeding for your dogs. Maintaining your dog in terms of hygiene and appearance is crucial and imperative. As the dog owner, it is your main obligation to ensure that your dog gets the right treatment and grooming that it deserves. While some dog owners would go dog salons or grooming center, the cost of grooming might baffle you, which is why you can reduce the cost of maintaining your dog’s grooming by doing it yourself. You might think that it is a heavy task, but with the right grooming tools, you can get it done. Things can get costly if you bring your dog to the grooming center and avail of their services. Since you are the one doing the grooming and the grinding the nails of your dog, you are cutting down the grooming expenses and at the same time personally take care of your dog. You might be wondering why the nail grinder is the best alternative for cutting or trimming your dog’s nails. The main reason is that the tool is effective and safe for use. More importantly, the nail grinder lessens the possibility of causing harm to your dog. There are many reasons why you need a nail grinder instead. If your dog’s nails are not properly in shape, it can render negative results for your dog. Here are the reasons why you need the best dog nail grinder sold in the market today. The nail grinder offers protection like no other. It is basically designed to provide comfort and safety. However, the challenge is that you need to know your way around these tools and handle these gears properly. It may be hard at first but you can get the hang of it later on. It is best to protect anyone if they come in contact with your dog. If your dog has caused them hard due to untrimmed nails, then the expenses are on you. One of the benefits gained from this tool is that it lessens instances of scratches or putting anyone at harm’s way. Remember, your dogs might not be aware of how strong they are and the harm that it could cause which is why grooming is a necessity. Besides providing your dog the grooming that it needed, the process must be less painful as well. Providing assurance for your dog is important. Dogs that have sharp claws or nails could eventually destroy anything. It can rip apart your furniture's and other items found within your home. One way to protect your properties and assets is to ensure that your dog’s nails are properly cut and trimmed. To do that, you need the best nail grinder to get the task on the roll. There are ample things in order to get the best grooming product for your dogs. In the case of grooming and trimming the nails, without the proper tools, it might be hard to do the grooming yourself. To save money, you can do the grooming process all by yourself, but before you could do that, you must have the grooming tools in your homes. Here are some of the things that you should consider before buying the product. When the product is durable, you can save a lot of money in the long run. That being said, you need to buy the right grooming product that is strong, sturdy and durable. In regards to choosing the right product, you need to consider the cost. There are products that are not expensive and yet provides the best results. Take the time to evaluate each product and check if the price is within range and will not have hefty price. When buying a nail grinder, check the product and its safety measures. Always consider this factor. If the product is not safe for use or has some reviews that reveal how the product is not ideal for use, do not buy it. Do not choose a product for its price or value, but choose the right product that offers the best safety features. When buying the nail grinder, choose the brand that is easy to handle and use. It is useless to buy a pricey product and yet it fails to deliver what you need. Consider the easy features and easy handling when getting a nail grinder. Take some time to weigh each product so that you can ultimately buy the right one. Always opt for convenience and portability. This is one of the elemental feature that must be weighed before choosing the right grooming product. The nail grinder must have a long battery life. Otherwise, the overall performance of the grooming tool is hampered. The battery is vital for the whole functionality and effectiveness of your grooming tool, if the battery life is short, it also shortens your capability to provide your dog the grooming that it deserves. The product simply stands out from the rest owing to its strong and reliable reputation of providing amazing grooming tools. The Dremel model is known as one of the powerful tools in the market today. It has proven its spot from the positive reviews and the specification given. Also, it offers buyer satisfaction beyond compare. It may be a new runner in the dog industry, but it is considered as one of the best products in the market. It has enough firepower and it is able to provide the grooming needs for your dogs. Also, this product is a corded one and has additional accessories as well. This product is one of a kind. It has a stunning design and it boasts of being durable. This tool is a corded model type and it is made to replace the manual clipping. The product is versatile in features. The fourth on our list is the Oster Pet Nail Grinder. This brand is known as one of the pet care product makers of this time. It has created multiple varieties of fur clippers. The product looks good, but despite its strong features, it's not enough to provide the best results for most dog owners. Has a carry or storage case. The Pedi Paws electric grooming manicure tool is an ideal product. It is a tool that provides trimming and grooming capabilities. It works with different kinds of pets and sizes. It is a versatile product and is very appealing for most pet owners. It is this versatility that makes it appealing to many pet owners. It is easy to handle and use as well. As a final say, providing comfort and grooming needs for your dogs are essential. 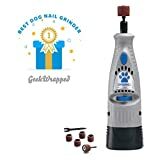 To get the best nail grinder for your dogs, comparing the five products mentioned above is imperative to provide you some guidance on which product to opt for. The final decision still belongs to you. Among the five models, the two products that stands out from the rest are the ones from the Dremel and Wahl brands. These tools are more preferable and ideal for use. Moreover, it is important to take some time to review the product and apply the considerations that we have also highlighted so that you can get the best dog nail grinder that your dog deserved. If you have used this product before, feel free to leave some comments below and give us the product that worked best with you. Looking forward to hearing your experience regarding the nail grinder that you have used.